I hunt with the V3i. I hunt for deep stuff. I mean, I go for stuff nine, ten, eleven inches or deeper. Trying to get there with the Lesche digger is just not nice. For those signals, I relied on my Sampson T-handle digger. I could dig ten inches down with that shovel in a second flat. But alas! I left it in the park one too many times and my luck finally ran out. Problem was, I always laid it down to unlock the car and after I put the detector in the car and every thing else, I often forgot the shovel. Every time I was able to notice or remember within the hour and recovered it. Except when I didn’t. So I’ve been passing up deeps signals right and left since the unfortunate morning when I lost my Sampson. But not anymore! Look at what I just ordered! 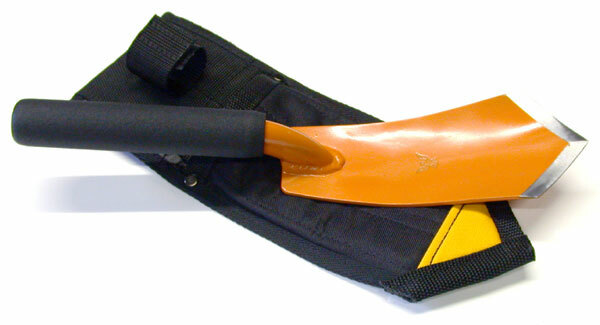 Raptor, model 31, from Predator Tools. Yeah! That’s not a digger; THIS is a digger!!! Eight inch blade and made to cut a plug and scoop dirt. Plus, it comes with a sheath so no leaving it at the park!